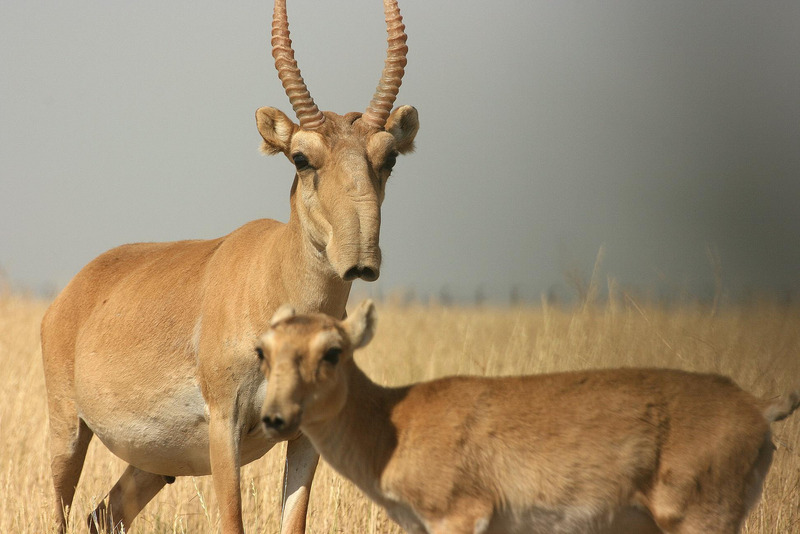 The Saiga Antelope is a critically endangered ungulate that is almost on the verge of facing extinction. 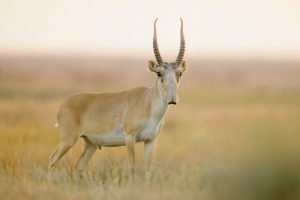 Very recently, in May 2015, almost half of the world’s saiga antelopes have died from a suspected infectious disease named ‘pasteurellosis’. The primary reason for their population degradation is that, they had been hunted down extensively in Moldova and Romania, for which they have gone extinct in these regions forever. Habitat loss and inadaptability also played a significant role in their mass extinction. These mammals have also been declared as extinct in China since they had been hunted down in conspicuously large numbers for their horns for making traditional Chinese medicines. Length/Size: The length of the males from the head to the body is 123 – 146 cm, and the females are 108 – 125 cm. Height: At the shoulder, the males stand about 69 – 79 cm, whereas the females are 57 – 73 cm. Weight: The males are anything between 32 and 51 kg, and the females are between 21 and 41. 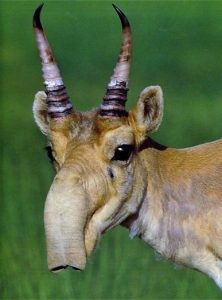 Nose: These creatures are popular for their elongated nose or proboscis that is hanging atop their lips that have given them a face somewhat resembling an armadillo’s. Body: Their body is robust and stoutly built. Feet/Legs: Long thin legs, very much similar in appearance to the sheep. Fur/Hair/Coat: Whole body is covered with cinnamon to sand-colored coat, which turns almost completely white during the winter season. While the summer coat is only 18-30 mm thick, the winter coat is 40-70 mm in thickness. Tail: Small tail of about 6-13 cm, quite similar to that of a goat’s. 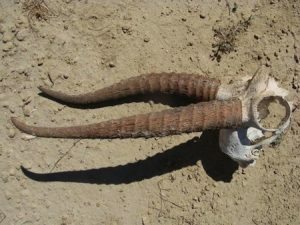 Horns: Ringed at the bottom. The shape of their colored horns can be small to large, and straight to wavy, depending on the sub-species. The saiga antelope lives for up to 6 to 10 years. 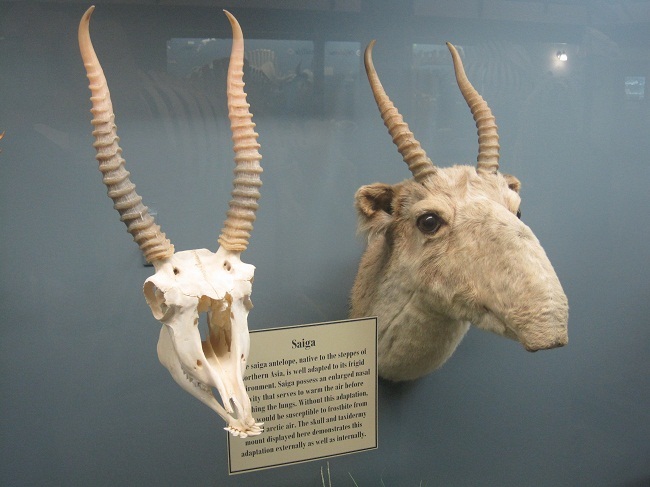 Previously, these antelopes inhabited a wide range around the world including the Eurasian steppe zone from the foothills of the Carpathian Mountains and Caucasus into Dzungaria and Mongolia, as also in the Beringian North America. 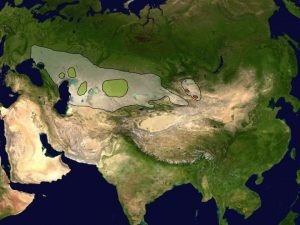 Presently, they can only be found in Asia and southeastern parts of Europe that includes Russia, Uzbekistan, Kazakhstan, Turkmenistan and Mongolia. 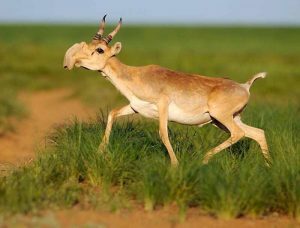 However, some opine that, those that live in the Mongolian regions are a distinct species, the ‘Mongolian saiga’ (Saiga borealis). They mainly prefer open dry steppes, semi-desert grasslands and open areas that are free from dense vegetation, where they are able to run quickly away from predators. 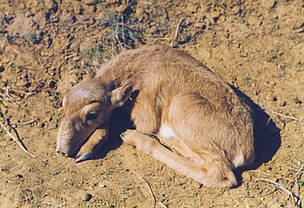 Saiga tatarica mongolica: Those that are found only in western Mongolia. Saiga tatarica tatarica: The dominant subspecies, found in the rest of their region of distribution. These creatures are diurnal or, are active during daytime. However, they might have a midday rest. They migrate long distances and walk with their heads pointing to the ground. One male takes charge of leading a whole harem of around 30-50 females. This usually happens after a fierce fight between two males during the mating season, which often ends in the bloody death of one of the two competitors. The winner becomes the harem leader. After the period of migration gets over, the animals split up in smaller herds. Saigas are timid animals and gets startled very easily, resulting in immediate flight. They display their timid behavior the same way in their herds as alone. The sense of hearing of these animals is poor. However, they have a very keen sense of vision that helps them see and locate danger over long distances of up to a kilometer. Normally, a thirsty Saiga would visit water holes twice a day. Saigas are herbivores and would mainly thrive upon prostrate summer cypress, saltwort, sagebrush, steppe lichens, grasses, herbs, and shrubs. 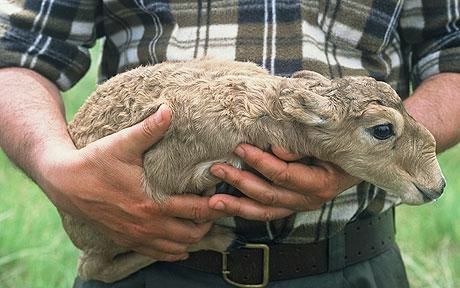 Saigas actually have very high reproductive potential. While the females attain sexual maturity within seven months from birth, the males would take almost two years for the same. The mating season starts in November. The stags would mate with the females in its harem. The female remains pregnant during its gestation period for about five months (152 days), after which, it gives birth to usually two (or sometimes one) foal. On an average, the saiga gives birth to 1 litter per year. After the babies are born, they are breastfed by the female for up to 4 months. Their weight at birth is about 3.5 kg, while they weigh around 14.5 kg during weaning. Saigas form a part of one of the most spectacular migrations in the world. They are very famous for their very long and exhausting migrations each year. Migrations start in November, and they are directed toward the winter grounds in the south. During this season, couples of tens of thousands of Saigas will travel together up to 72 miles per day. The famous hanging nose of the saiga antelope acts as filter. It prevents dust particles from entering their lungs as also regulates the coldness and heat of the inhaling air before reaching the lungs during the summer and the winter months. They are able to eat several species of plants, including some that are poisonous to other animals. 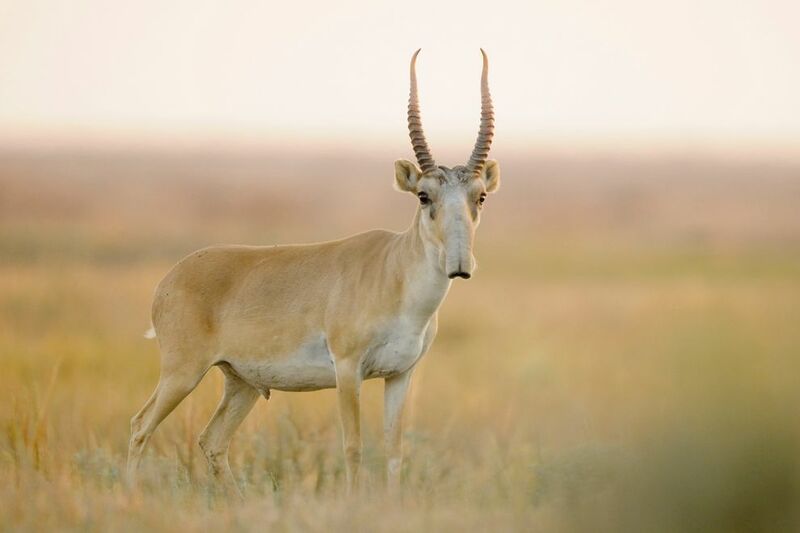 The saiga antelopes can easily cover long distances in herds and even swim across rivers, unlike other antelopes. This is a big defensive adaptation. Saiga is a very fast animal. It can run up to 80 per hour, especially when it is trying to escape from the predators. The primary predators of these antelopes are the wolves. However, foxes (like the Red Fox, Corsac Fox), feral dogs and birds of prey (like the Golden Eagle) also feast on them. However, apart from natural predators, humans played a big role in predating these precious creatures of nature, as discussed above, mainly for its horns. Only less than two decades ago, the population of these ungulates stood at more than a million, and seemed to be relatively stable. Though, extreme pressures of poaching in the 1990s, along with the collapse of the USSR (Soviet Union), caused their count to diminish to less than 50,000 in just 10 years. 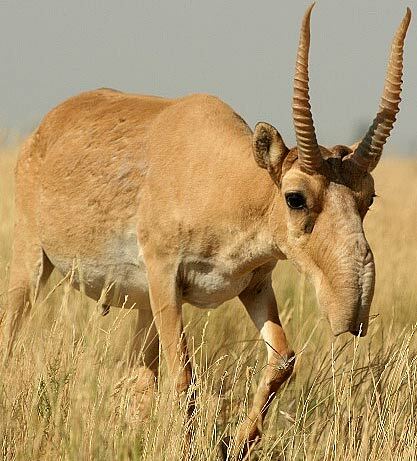 The saiga antelope is a critically endangered species. The IUCN 3.1 has categorized them under the ‘CR’ (Critically Endangered) species list. These antelopes are a distant relative of the gazelle, as also resemble a small sheep. The male saiga antelope has a short mane on its neck. With their male to male fatal fights, the mortality rate can reach 90% during their mating season. This antelope has been categorized by the WWF as a ‘priority species’, which means, they are treated as one of the most economically, ecologically and/or culturally important species on our planet. 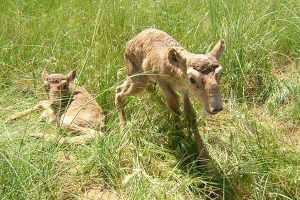 Young Saigas have been noticed in captivity to be nursed by other adult saigas that are actually unrelated to them. Because of selective poaching for their horns, the ratio of the number of males (with the females) has significantly declined.